Alcohol is safe in moderation -- generally defined as one drink a day for women and two drinks a day for men. People who exceed these amounts or abuse alcohol daily often develop vitamin and mineral deficiencies because alcohol interferes with the body's ability to absorb nutrients. Folate, also called vitamin B-9, is essential for the growth of new cells. The absorption of this vitamin is inhibited by ingestion of alcohol. Alcohol inhibits absorption of folate and other vitamins by killing the cells lining the stomach and intestines that mediate the absorption of these nutrients. Alcohol reduces the ability of the body to absorb the vitamin thiamin, also called vitamin B-1 that helps break down carbohydrates, proteins and fat in the food you eat. It also aids in production of hemoglobin, the protein that binds oxygen in red blood cells. A severe deficiency in thiamin leads to a life-threatening brain disorder called Wernicke-Korsakoff Syndrome, characterized by memory loss, confusion and trouble maintaining balance. If severe, it can even lead to permanent brain damage. Alcohol also causes reduced absorption of vitamin B-12. This vitamin is important for the health of both nerve cells and red blood cells. Excessive alcohol use can result in a deficiency in this vitamin that can lead to a nerve disease called peripheral neuropathy. The symptoms of this disease are tingling sensations and/or pain in the extremities. Some vitamins, including vitamins A, D and E need to be dissolved into fat molecules to be used properly in the body. Alcohol inhibits the absorption of fats, which in turn inhibits the absorption of vitamins A, D and E. Vitamin A deficiency leads to night blindness; vitamin D deficiency leads to bone softening; vitamin E deficiency leads to nerve problems. Deficiencies in this mineral as a result of alcohol consumption are a result of inefficient absorption of due to alcohol. This inhibition is an indirect effect of alcohol and, like vitamins A, D, and E, is also due to the decreased absorption of fats. A deficiency in calcium can lead to softening of bones. Alcohol can cause an iron deficiency due to gastrointestinal bleeding. Iron is necessary for the function of red blood cells, and thus a deficiency may result in anemia. Alcohol can cause a zinc deficiency by decreasing how well this mineral is absorbed, but also by inhibiting the absorption of other nutrients that zinc depends on for its function. Normal levels of zinc are needed for optimal growth during childhood and for normal taste and smell. 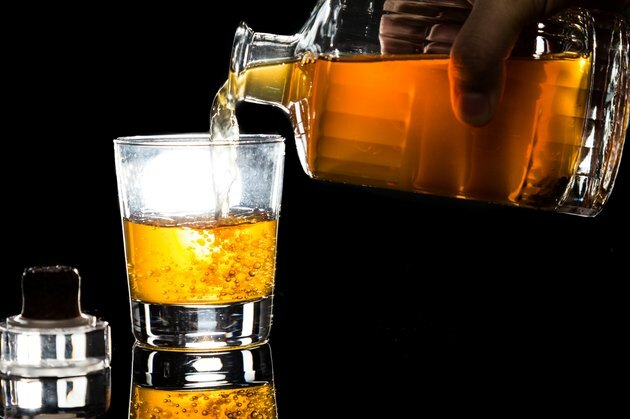 How Many Calories Per Gram Does Alcohol Yield?